Students - This past Wednesday, I visited Plank South Elementary School in Webster, NY, and at the end of the day, fourth grader Alex showed me her small toy turtle Squishy (can you see part of his name on that yellow sticky note? ), and his neat paper home. 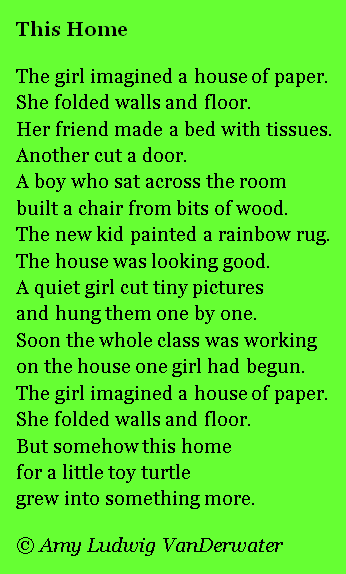 She began with the folded walls and floor, and her friends were helping her build the rest (not exactly in the way my poem says...I made some parts up). When I saw this paper home, I thought, "If I were Squishy, I'd be happy to have such a cozy place to live!" 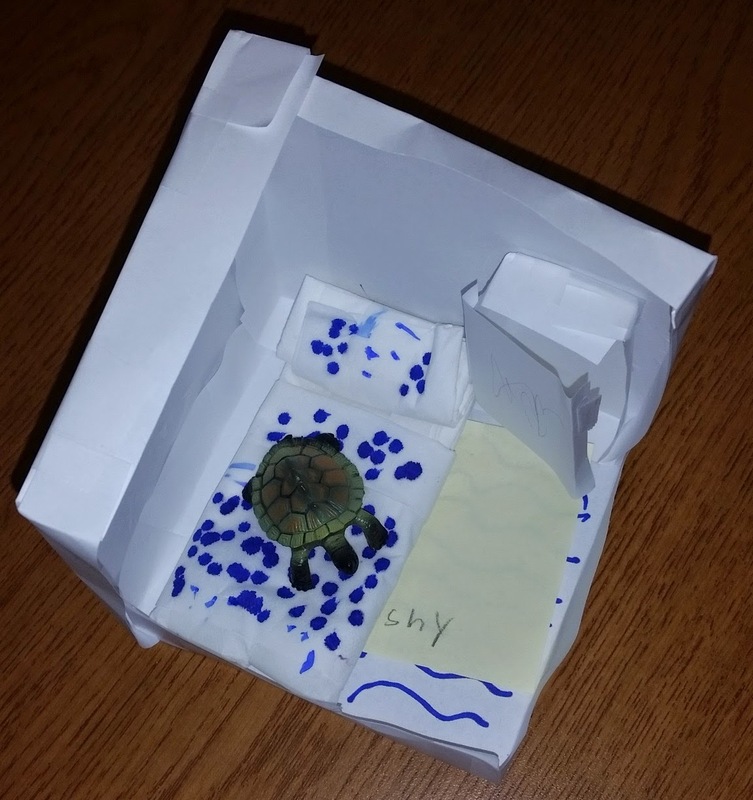 When I was a young girl, I loved making homes for little animals out of boxes and anything I could find. So, seeing Squishy's home struck something inside of me. Much of writing is about just this - being struck by things. And then notice when you are struck. What do you find funny or quirky or deeply sad or fascinating? These are the things you should write about. Taking pictures helps me to remember, but so does my notebook and so does this blog. Now, because I wrapped my arms and ink and time around this memory, Alex and her friends and Squishy will always have a little piece of real estate in my heart. Thank you, Alex! You will notice that there is a rhyme scheme to this poem. It is almost in squished together quatrains, except for the last lines which stretch out from four to five in order to slow down the ending. I am so pleased to welcome Natalie S. today! Earlier this week, I also visited another school - Douglas J. Regan Intermediate in Lockport, NY. As a part of that visit, I had the opportunity to eat lunch and write with several fourth grade writers, including Natalie from Breann Kolacz's class. Natalie offered to share this poem with all of us for today's Poetry Friday gathering. Don't you feel like you are there? Thank you so much, Natalie, for this lovely tour of memory and beauty. Gena has won this month's drawing over at Sharing Our Notebooks. Gena, if you see this, please drop me a line with your snail mail address and your choice of book. Congratulations! And to all who notebook or know notebookers, I am looking for new posters over at Sharing Our Notebooks. Right now I am particularly interested in all kinds of unusual notebooks and also notebooks kept by boys or men. It would be good to get some guy notebooks up over there, so if you know any notebooker of any age, I would so appreciate it if you would send that person my way. Heidi is hosting today's Poetry Friday roundup today over at My Juicy Little Universe. Be sure to CHeck out the CHallenge she has offered for MarCH! Please share a commnent below if you wish. Absolutely, I'd love to live in such a cozy home as Alex made! Thanks for sharing all this coziness today, Amy. And what thoughtful, creative students. Congratulations to Natalie on such a welcoming poem - and I LOVE the unexpected inclusion of stars at the very end. Your thoughts on being "struck" are pretty much the essence poetry for me - thanks for articulating. This little girl and Emily would work together well. She has made a bed out of a kleenex box for our stuffed Hedwig. I wish we could bottle up this creativity. I like how you saved the image in your heart with a poem. I have a student who has chosen to study miniatures for her next topic research. This is wonderful, & your poem captures it all so nicely, Amy. I'll share this with her. Natalie's poems connects with it so well. Thanks for all! With help from friends, a house became a home! Thanks so much for passing this along. I'm glad the turtle story caused good memories to surface! These days, I'm just thrilled when a kid MAKES something (that isn't 2D on a screen). On our snowday this week Duncan suddenly turned a sweet potato into a walrus with toothpick tusks and tortilla chip flippers. P.S. Have you seen this??? I love the spontaneous camaraderie of the kids in your poem, and like Heidi said, that they are making something! Well, I made houses for all manner of items in my childhood, too, Amy - and love the coziness these poems summon up - coziness and the power to imagine. I love it when children make little homes for their stuffed animals, and I love it even more when friends help! Another lovely poem, Amy. Thank you!